Nel Whatmore: SEPTEMBER THE CAT CLUB FREE GIVEAWAY ONLY 10 DAYS LEFT HURRY!! SEPTEMBER THE CAT CLUB FREE GIVEAWAY ONLY 10 DAYS LEFT HURRY!! Well it seems as though my computer is playing up a little as this is the third time I have written this! Third time lucky hopefully if not it's going out the window or I shall go in search of chocolate, actually may do that anyway. Well October is shaping up to being very very busy, if anyone thinks they could paint a picture or two for me or has discovered how to clone themselves then please shout out now as there just needs to be more time or more of me! Our son Dave has gone off to Univeristy last week. I managed not to howl like a lost soul on the way home, mainly because Polly our daughter was doing that anyway. Anyway so far so good, he's been to four parties and isn't getting enough sleep so fairly normal student first week really. 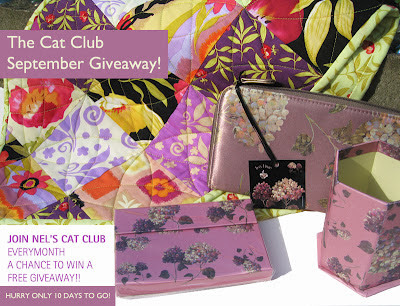 For those of you who haven't already seen it here is the lovely The Cat Club September Giveaway. It includes a table runner using my first collection for Freespirit " Happy Go Lucky", and then the other items are from a french company we have been working with who produce very high quality bags and stationery items. I think who ever wins it will love it. For those that haven't already joined all you need to do is join The Cat Club, which is entirely free and then we pick one lucky winner a month and I let you know when the next cat pattern is uploaded, as I do one per collection. Just to let you know Katharine's Wheel is proving extremely popular and it looks as though it is going to sell out very quickly so if you want to order any I would suggest you do it sooner rather than later. Paintingwise what's coming up? Well I am working towards my next originals show which is at Chantry House Gallery, Ripley North Yorks starting on Nov 3-18th. I will be there every saturday. I am working on atmospheric landscapes as a bit of a change , although there will be the usual eclectic mix of other things too. So look forward to seeing you there. by monday. You can make them into mirrors too or photo frames. Have just finished making the Katherine's Wheel quilt - LOVE IT!